Tomoka is a sixth grader and the best player on the girls' basketball team. She is a competitive girl who enjoys winning but has grown to prefer simply having fun playing with her friends. Her skilled jump shot is a large part of what convinces Subaru to coach the team. 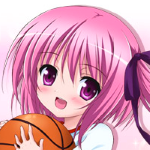 Tomoka's growing friendship and bonding over basketball with Subaru is the strongest among all the girls, such that she may have started developing feelings for him.